My lovely Slouchy Crochet Cardigan has officially been placed on hold. Not time out, as many of my projects seem to be placed when they are naughty, just on hold. The big news is there are three baby blankets that need to be made, and I might add they need to get done quickly. Each baby is cooking at over the 20 week mark and frankly I am afraid they are all coming at the same time. 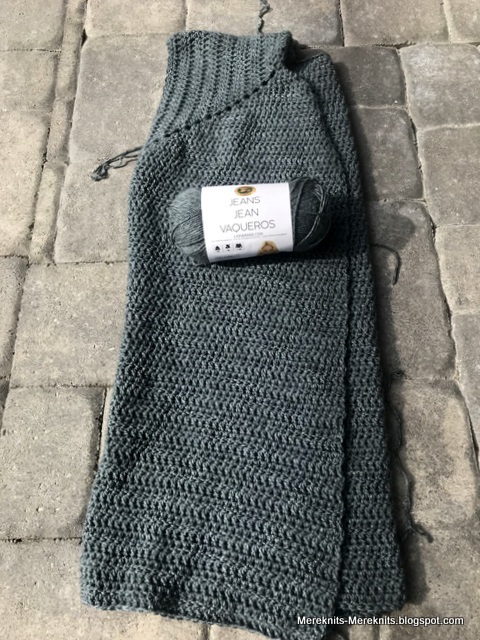 I asked my husband for a gift certificate to my favorite yarn store for Christmas because I knew these blankets had to be made. And this week when faced with the decision to either drive and hour to go see two children getting over fevers and throw-ups, or driving a half an hour to the yarn store to pick out baby blanket yarn, guess which option I picked. These are going to be simple crochet ripples, I've made many before. 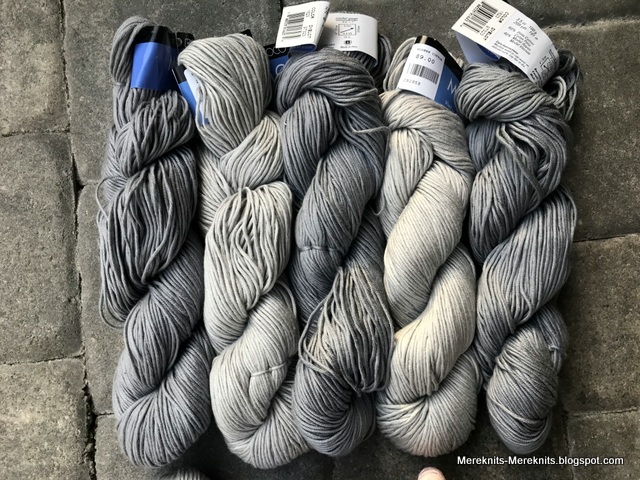 There is one problem, I got these yarns out of the bag to take some photos and realized I was missing a skein of light grey. Knowing I paid for ten skeins I called the store and they put one aside for me. I hope to pick it up this week along with yarn for blanket number three. I just found out it will be a girl so I can get that yarn ready to go. That's one boy blanket and two girls. There is one big issue I am going to have and that is time. When am I going to find the time to make them? I better get moving. 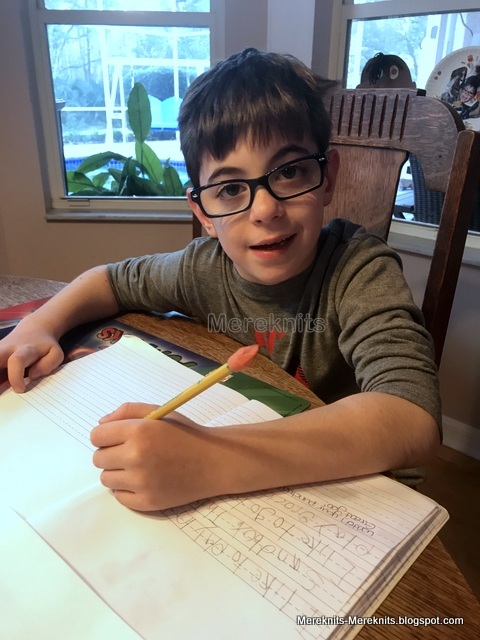 Here is a photo of Little Buddy doing his homework yesterday afternoon. He had three pages of math and had to write a story, boy did it take a long time. The story was about whether you would like to travel on a plane or a train. He picked a train. This was one of his sentences, "I have ridden on a train at Tampa International Airport in Tampa Florida." Some of the spelling was questionable, but still the sentence made me smile. He rode on the monorail to get from the main portion of the airport to the planes. He is a funny little one. 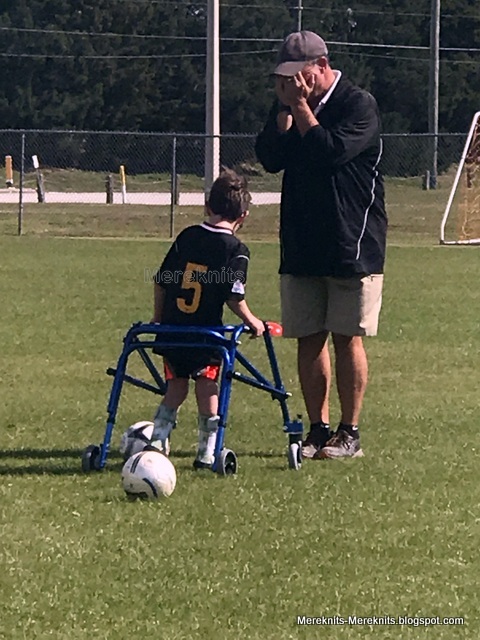 This is Coach John and Little Buddy at soccer today. I really love this man. He is so kind and funny. 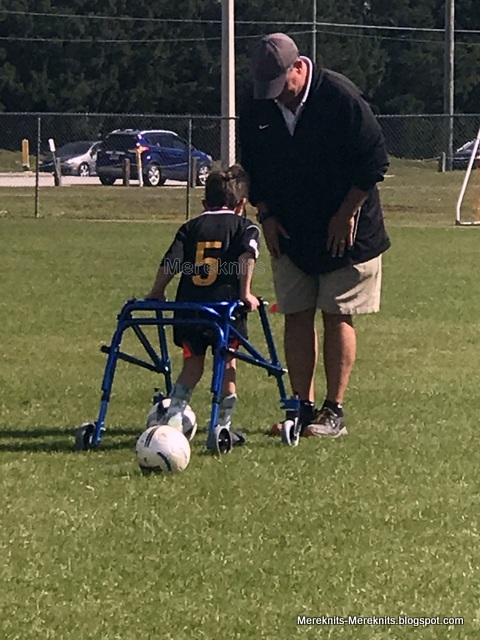 He lets Little Buddy come right up to him with his walker and then Coach John falls down on the ground like he is being run over. Then Little Buddy falls over and they both roll around the ground laughing and laughing. He spends a lot of time with Little Buddy and really seems to enjoy him. Let's just say not a lot of soccer skills were learned today, but it was beautiful out and Little B had a great time, that is all that matters. There can't be a post without a photo of these two, Crazy 1 and Crazy 2. Have a lovely weekend my friends. Love all the photos. 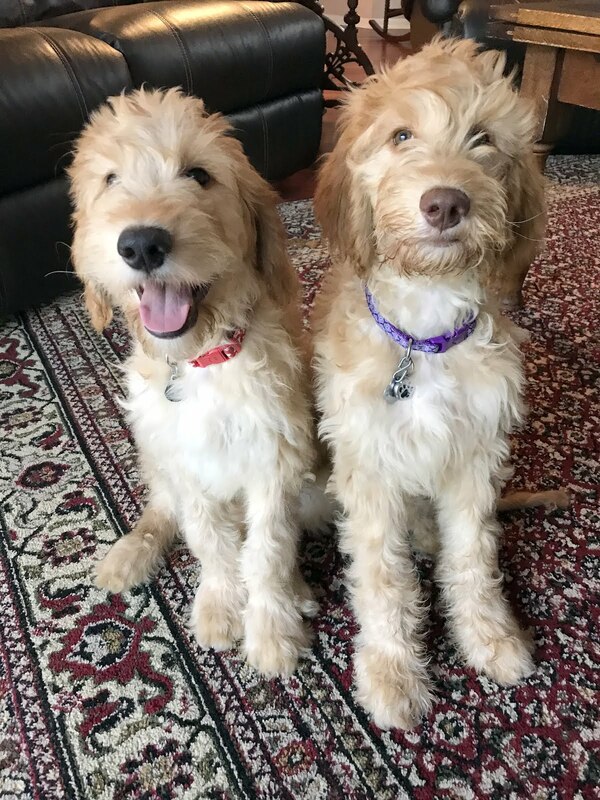 Your pups always look like they are smiling. So, with all the changes .....which is your favorite shop now. I heard Stash took over for the old Rosies. All that pretty yarn made me swoon!!! Your nice weather is leaving me a bit jealous. We are having very low temps with a big snow - I hesitate to say 'blizzard' as I have seen much worse. I happen to like driving in fresh snow - it's the other drivers who are a danger! So nice to see Little Buddy enjoying soccer and Coach John sounds such a great guy. Haha! Buddy and his coach! How cute! I'm working on my granddaughter's quilt next month for sure. Need to finish a few things this month. Enjoy your crocheting projects. Of course the babies will grow into the blankets. Check out my post Tree and Me...there's a picture you'll like. Wasn't able to email it to you as I couldn't find your email address any where. Have a good weekend! Meredith, your yarn choices for the blankets are beautiful. I know those babies will be all snuggly and warm in them. Little Buddy’s coach is a gem. I love seeing coaches like this. There is too much emphasis on winning in children’s sports. Just my opinion. Let them be young and have FUN! Now. I’ll get off of my high horse. :-). I hope you are having a lovely weekend. Beautiful yarn. Always a joy to crochet for new babies, they bring so much joy into our lives. A delight to see Little Buddy having so much fun with his coach. I smiled about his monorail trip across the airport, what a joy that little man is. We have been browsing the internet for Florida holiday deals. Little Buddy's thoughts and feelings make me smile, and I always say this about him. Keep posting those pics of him...just love them! Lovely choices.Looking forward to seeing the finished items.Little Buddy as gorgeous as ever. Reading the title your post worried me. I was afraid the BOYS had destroyed the yarn. What a relief! OH! what is not to love! new babies... cozy little blankets... a coach with a huge heart and a most precious little boy! … who happens to share my love of riding on trains! even when they're called Trams! LOL! I'm with Buddy! don't wear yourself out darling Mere! betcha you can't accidentally end every sentence with an exclamation point! XOXOXO … these are huge Snoopy Hugs. did you ever wonder? the kind that Woodstock and Snoopy give to their friends. Lil buddy has the perfect home and family. Having two much bigger brothers may have infleunced his vocabulary and insight. i love his sentence. His soccer coach sounds like a very kind and funny guy. Like lilb who is also kind annd funny. Your baby blamkets yarns are gorgeous!!!!!!!! Good plans. I have two babies to knit for as well. Oh puppies. So beauttiful. That yarn is gorgeous. What a lovely thing to be putting the cardigan on hold for, baby makes. nothing nicer. Little Buddy is such a good boy doing his homework and I agree with him, I'd much rather take a train than a plane. Well I’m sorry to hear your two big ones have had that horrid throw up stuff! And I understand that panic of crunch mode when babies are popping all over and you have to/want to/need to/LOVE TO make something to welcome them into the world! With your work schedule, Little Buddy and Crazy 1 and Crazy 2 ... I’m gonna start praying for you on this right NOW!!! And DANG I was looking forward to that finished Cardi! I love it that Little Buddy has such an Awesome man in his life outside of his own family. Coach John is what all people who work with children should be. I hope you find time to make the blankets :) The coach sounds like such and angel blessing to Buddy (and you). I love how the universe drops people into our life that make a difference for the better! Beautiful yarn for the baby blankets....too bad you can't come up with a way to crochet while driving! Cute story about the coach and Lil Buddy! 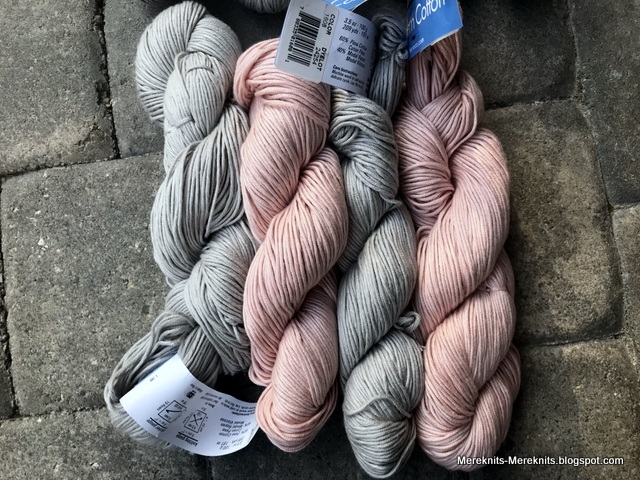 Gorgeous yarns! Looking forward to see to your finished blankets. The coach sounds to be such a fun guy. Cute photos of your boys and Little Buddy! 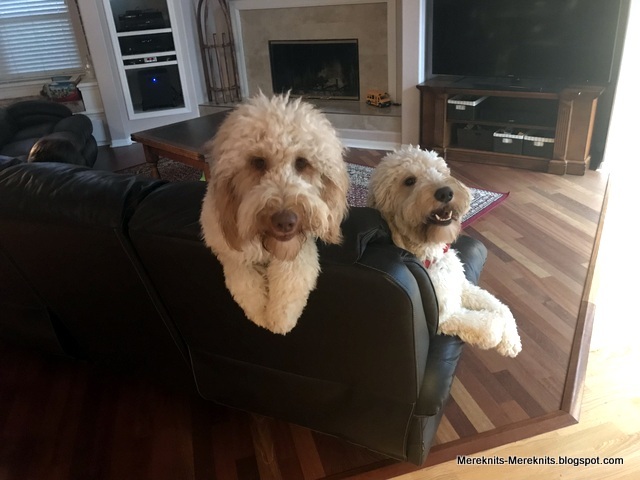 Wow - great soccer coach - dogs looks so sweet (just thinking up what they can chew next), homework - Little Buddy looks so great. Thanks Meredith for sharing such great snippets of your family. Sounds like you are feeling better than last week. That rose and gray combination is completely gorgeous. Can't wait to see it complete. The Crazies look freshly groomed/clipped. So handsome! The colors for the blankets are so soft and pretty. LB looks so grown up doing homework. Love those pups! I am knitting slippers for a friend. 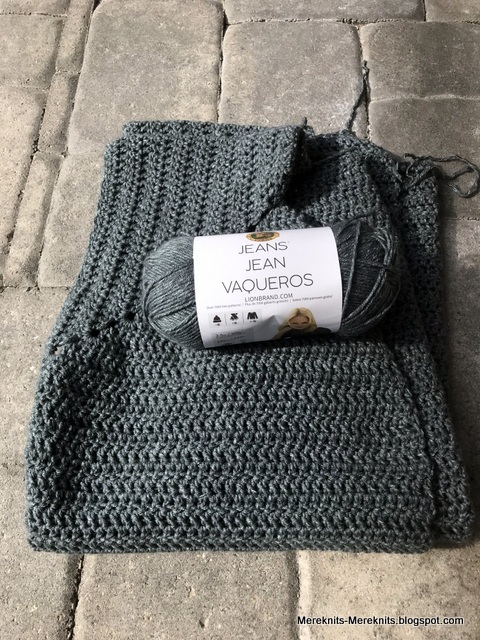 I'd much rather be knitting baby blankets! Can't wait to see what you produce from that wonderful yarn. I can see why you love the soccer coach. LOVE the pink and gray, will be very nice, and the gray for the little boy. Will be anxious to see what you get for the other little girl........yikes though 3 baby ghans...get a move on. Hope you are finding time for those blankets; handmade gifts are always so special! I, too, have fallen behind in the posting dept. once again; this time I've been sorting my stashes...yikes is all I can say! No more yarn/fabric/X-stitch shopping for me, that's for sure. The baby blankets will make lovely gifts. I can’t wait to see the finished projects. Most of my posts includes one or all of my fur babies. I hope that you are all keeping warm, I hear that it is brutal out there. That is a very cute, sweet, and honest sentence. The soccer coach sounds wonderful, and your son looks so great in his uniform. Your dogs always make me howl with laughter.